time .. can also be set to shut. off automatically at night. Buzzer alarm sounds 10 minutes after radio starts. Switchable automatic frequency control for drift-free FM. t ion easy. Tone control lets you choose sound you prefer. to-read clock face and dial. Solid state chassis. UL listed. trim: 5 3hxl2'3/.c x4 inches deep. 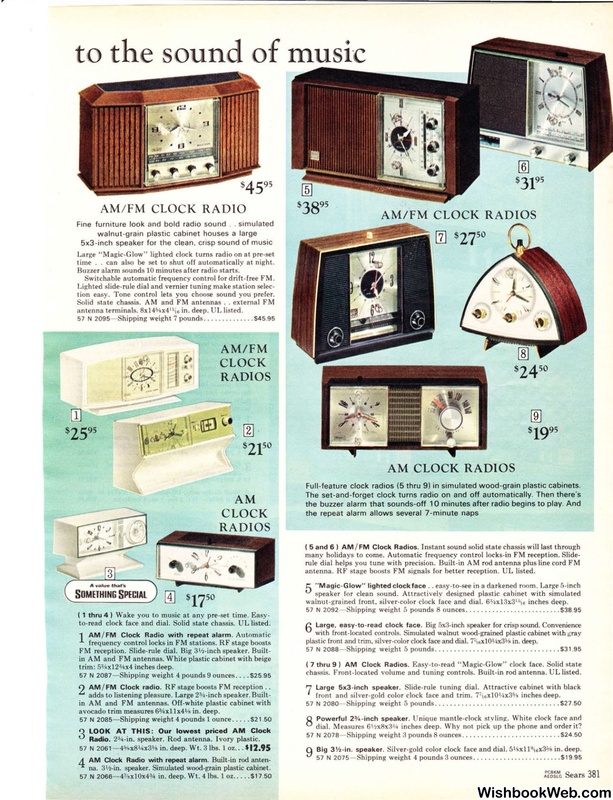 AM / FM Clock radio. RF stage boosts FM reception . .
avocado trim measures 63Axllx4V. in. deep. speaker. R od antenna. Ivory plastic. .4x3% in. deep. Wt. 3 lbs. 1 oz. . .
na. 31fi-in. speaker. Simulated wood-grain plastic cabinet. Full-feature clock radios (5 thru 9) in simulated wood-grain plastic cabinets. antenna. R F stage boosts FM signals for better recept ion. UL listed. walnut-grained front, silver-color clock face and dial. chassis. F ront-located volume and t uning controls. Built-in rod antenna. UL listed. inches deep. Why not pick up the phone and order 1t? Big 3 V2-in. speaker. Silver-gold color clock face and dial. 5\i<xl1'1sx3% in. deep.